"My Word! I've hooked a . . . Whale?!" A pudgy little sun-baked man stood clinging with all his might to his drooping fishing pole bewildered at just what it was flopping around at the end of his line. "Put me down!—You confounded, interloping, landlubber! Put me down or so help me . . . I'll turn your sorry duff into a sponge! . . . " Isolato gasped for breath, fighting in earnest to wriggle free of the hook lodged firmly in his fish tail. "It talks too?! My Word!" So startled to hear such profanity from his 'whale', the fisherman dropped his fishing pole and the irate Sea Lord onto the rowboat's planking. Isolato landed with a soggy Thud! Ambrose' brows arched when realizing, this was a fish, only from the waist down. The rest of him was an old man with a crop of leafy green whiskers. He tried to set things right by offering this 'merman' a towel to dry off. "Keep your towel, Confound it!" Isolato was growing more irritated trying to remove the hook from his tail. "The last thing I want is to dry off! Keep your apologies too, 'lubber. You've landed yourself a whale's load of trouble if you don't get me back into the water." 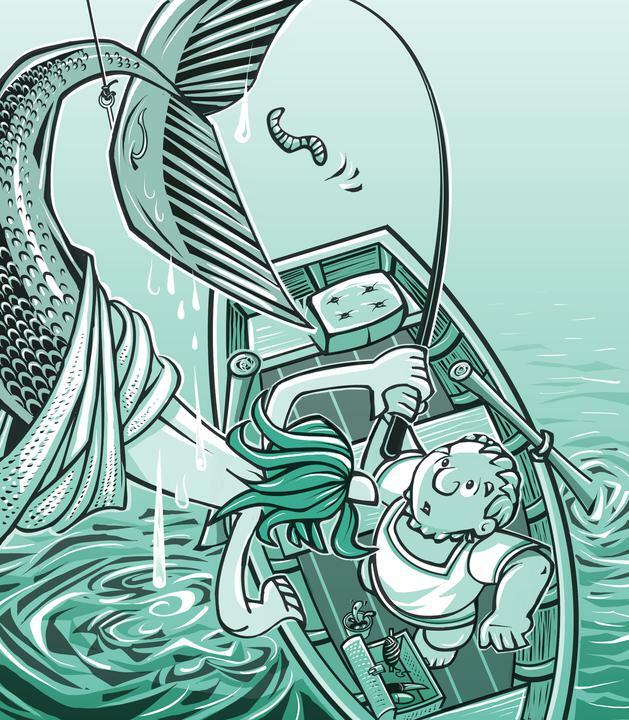 "Forgive my rudeness," said the fisherman. "My name is Ambrose . . . Here, let me help you with that hook. I'm dreadfully sorry about all this. Of course I'll throw you back—"
"THROW me back?" screamed the Sea Lord. "I'm Lord Isolato, god of all waters. Lay even a finger on me and you'll be trolling my lake bottom like a flounder." Ambrose shook his head while replying politely. "Well . . . Fact is, Lordship, the BOTTOM of your lake is mine. I own this lakefront property." "Confound It! I don't give a carp about YOUR property—just stay off of MINE! You're the trespasser here. You're on MY water. There's no denying that!" "Actually . . . I'm not on your water. I'm in MY boat. To be even more precise—you are too. So while you may lord it over the water, I own the land the water sits on. You could say I'm your 'land-lord'." Having removed the hook successfully, Ambrose seated himself triumphantly by the oarlocks, while his 'catch' continued to flop around on the forward planking. For a moment, Isolato's brow was all furrowed and crunched as he sorted out what Ambrose had said. In the end, he decided the best way to piece together this puzzle was to rearrange the pieces.